Just as with your finances, there may come a time when you cannot speak for yourself regarding medical treatment. 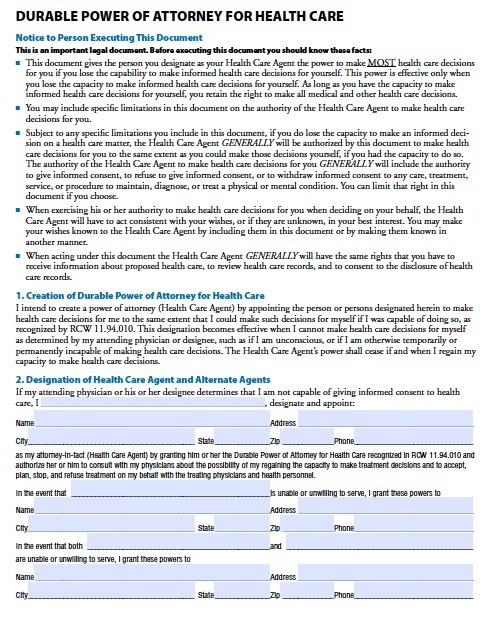 Advance directives enable you to nominate a representative to make health care instructions for you, and give doctor’s instructions about what types of treatments you would and would not like to receive. A healthcare representative can consider treatment options according to your values. For example, if a procedure has a great deal of risk, but could result in a drastic improvement in your quality of life, you can instruct the representative ahead of time that you would prefer to undergo that treatment. Alternatively, you could specify that you would prefer not to undergo risky procedures. Washington also permits you to provide a living will, which would only apply if you suffered from permanent unconsciousness or a terminal condition where life-supporting treatment would merely prolong life. With the living will, you can specify that you would not like to receive life-supporting treatments if you suffered from such a condition, or you could specify that you would like to.